Happy income report day, friends! If you’re reading this on the day we posted it, Donnie and I are currently in Salt Lake City, UT where I am having a blast at the SNAP blogging conference, and he is having fun exploring the city! If you’re at SNAP, be sure to find me and say, “hi!” I’d love to meet you! 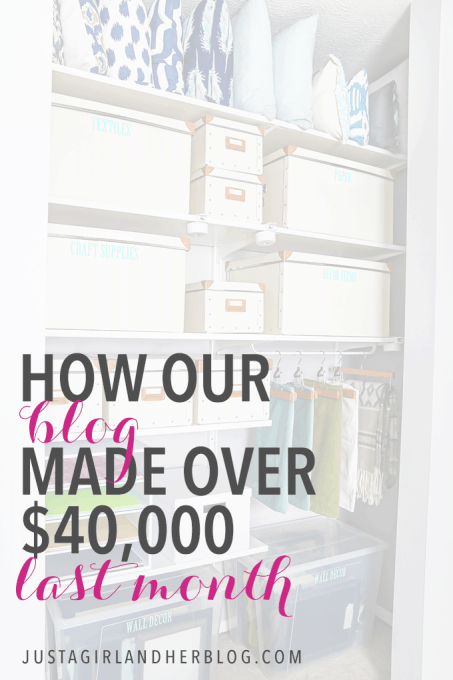 Every month Donnie crunches the numbers and we share exactly how much we’ve made from this little blog of ours. 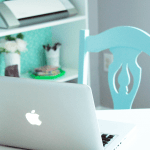 Kind of strange for a decor blog, we know, but being able to make an income from blogging has literally been life changing for us, and if we can help others meet their blogging goals through sharing what has worked for us (and what hasn’t! 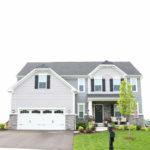 ), we will be thrilled to have been just a small part of their success story. 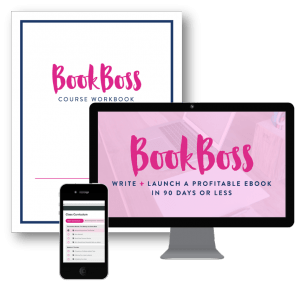 The last week of March Abby and I officially began pre-selling our new course, BookBoss: How to Write and Launch a Profitable eBook in 90 Days or Less. In the past we’ve had short pre-sale periods for some of our eBooks, but for this more extensive video course we decided to have a multi-week pre-sale period during which we would offer webinar training with an offer to purchase BookBoss with the pre-sale pricing at the end. We did one webinar in March and two already in April. Our webinar process is still a work in progress, and we’ve had our fair share of technical challenges. 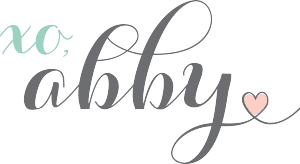 After Abby and I are done with the BookBoss launch, I’m planning to write a full post on Building a Framework about our entire process and what has been working and what hasn’t. Live video is always a technology challenge. There are just so many things that can go wrong, and you don’t have to do webinars for long before you have some major issues. We’ve been using Crowdcast.io for our webinars. It’s worked well for 2 out of our 3 webinars, but one of them had major issues because of an expired security certificate on Crowdcast.io. Many of our attendees weren’t able to view because of security warnings in their browsers. Not good. Crowdcast isn’t cheap, but we signed up specifically to avoid these type of issues. We’re going to continue to use Crowdcast during this launch period but then will most likely start using the embedded Google Hangouts On Air Method. We can embed the code for the Google Hangout as well as a chat box directly onto one of our Instapage landing pages. There is certainly more work with this setup. For the most part, Crowdcast has been good. But we’re paying $199/month, and I was hoping it would be a near flawless process with a great experience for our webinar viewers. 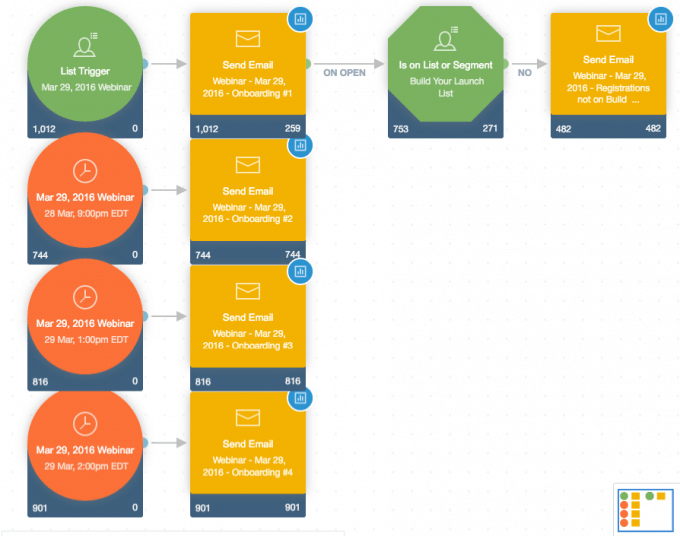 One of my favorite things about hosting a webinar is that it allows me to set up a lot of email automation. It’s fun to write multiple emails ahead of time and then set everything in motion. 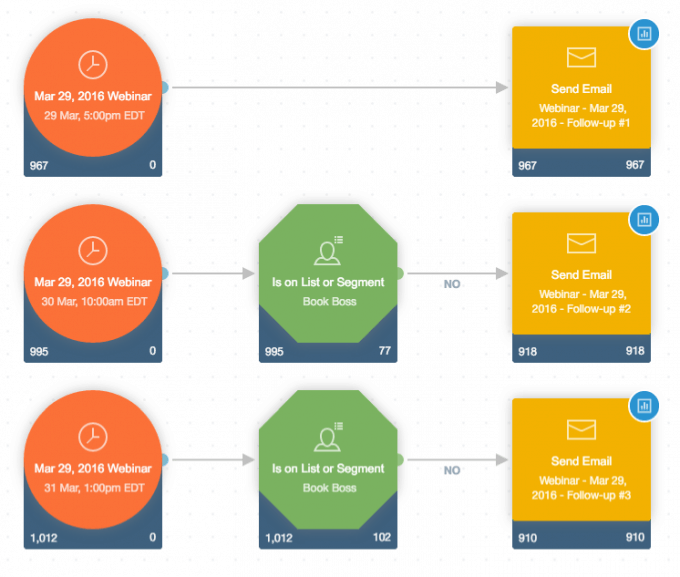 Here’s a peek into our webinar registration, on-boarding, and follow-up sequences. 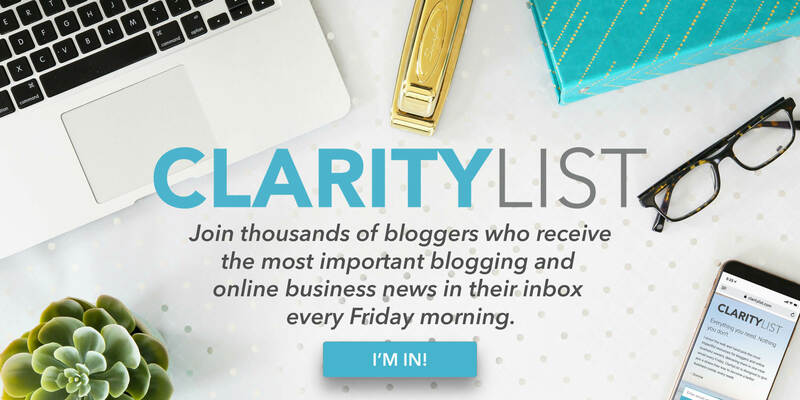 Our main email list is in ConvertKit, but our smaller blogging/business list is in Autopilot. 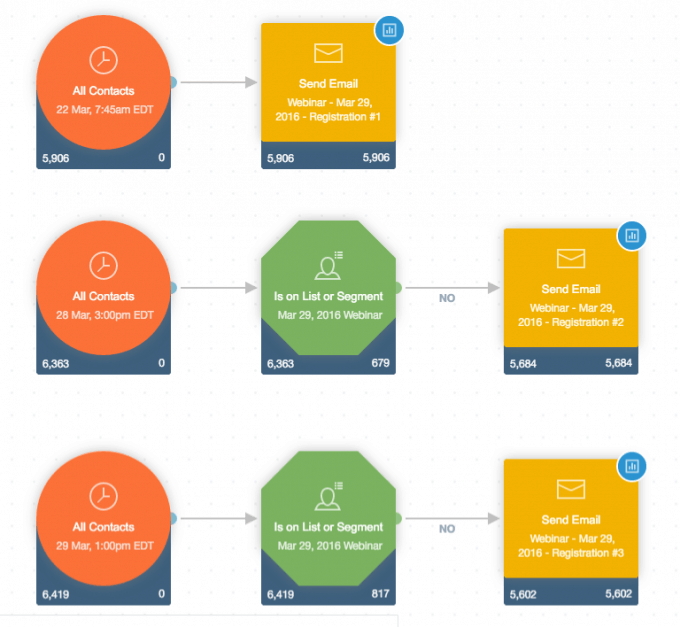 What you see here was set up in Autopilot (with a nice visual automation builder), but it can all be accomplished easily with ConvertKit as well. We sent three emails encouraging our list to register for the webinar. 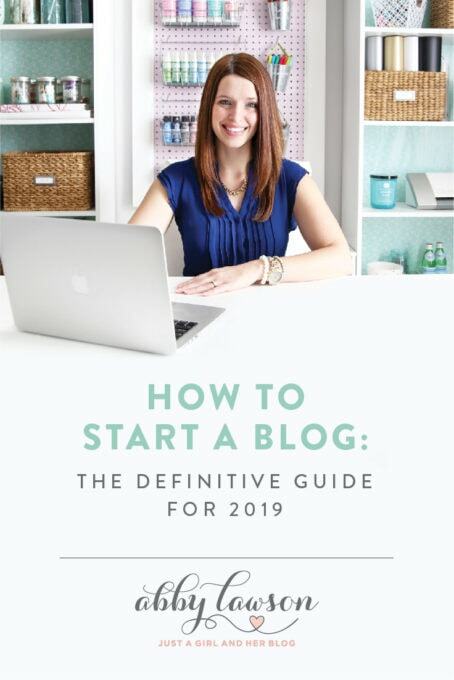 This wasn’t to all of our email subscribers, but only to those who have indicated at some point in the past that they were interested in blogging or online business. The first email was 7 days before the event, then one the day before, and finally an email to get more webinar signups an hour before the event. It’s interesting that even an hour before the event, after already receiving two emails about the webinar, the email had a 34% open rate and a 5% click rate. 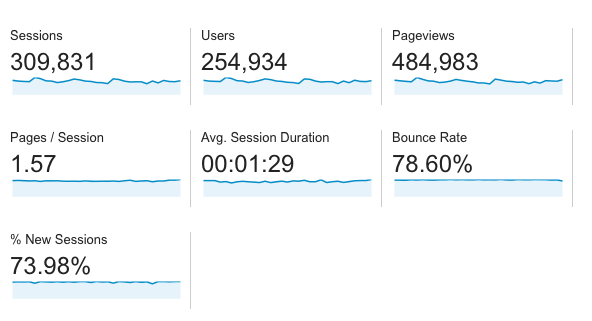 Those numbers are just slightly worse than the very first webinar registration email. I think some people just need multiple reminders. For emails 2 and 3, I excluded people who had already signed up and were on the Mar 29 webinar list. No need for them to get a registration email for something they already signed up for. As soon as people registered for the webinar, we sent out a confirmation email with all of the details. If the recipient opened the email, I took the opportunity to send them another email asking them if they wanted to take our Build Your Launch List email course. You can see in the top line of the journey above that the second email was only sent after someone opened the registration confirmation email. Even then, it was only sent to those not already enrolled in our free email course. That final email on the top line had an 82% open rate and a 36% click through rate to our free course landing page. Those numbers are unheard of but because it was only sent when someone opened the previous email, most people were already in their inbox. Based on those open and click rates, I’ll certainly be experimenting with more “email open” trigger automation series. I was hesitant to send so many reminder emails, but I’m glad I did. We sent a reminder email upon registration, 1 day before, 1 hour before, and as the event was starting. We decided to keep the webinar replay up for 48 hours. A live event just won’t fit into the schedule for everyone. A few hours after the webinar ended, we sent an email to all registrants (whether they attended live or not), recapped the webinar, and provided a link to watch the replay. The next day we sent another follow-up email, but this time only to the webinar registrants that didn’t purchase BookBoss at the pre-sale pricing. There was no need to encourage current customers to make a purchase. Even the final follow-up email had a 58% open rate and 23% clicked through to view the BookBoss landing page. As it turns out, we made more sales during the 48 hour replay period than we did during the live event. I think a lot of this had to do with our follow-up sequence. Now that I’ve built these journeys in Autopilot, it’s just a matter of duplicating them and tweaking a few things for future emails. Autopilot is pricey (and getting even pricier), but the visual nature is very helpful for me. ConvertKit is still the right choice for 90% of bloggers; you just may need to draw out a journey by hand before getting it setup with ConvertKit automations. Let me know in the comments if you’d like a dedicated post with our entire webinar process and all the technical details. We’re new to this webinar thing, but we’ve certainly learned a lot over the past few weeks. A few days ago Abby and I were thinking back over all the eBooks and digital products we’ve launched over the past few years. For each one we were able to recognize a turning point in our business. It seemed like every time we went through the launch process for an eBook, our business took a significant step forward. That’s why I am ridiculously excited about our new course BookBoss: How to Write and Launch a Profitable eBook in 90 Days or Less. It’s going to help so many people. 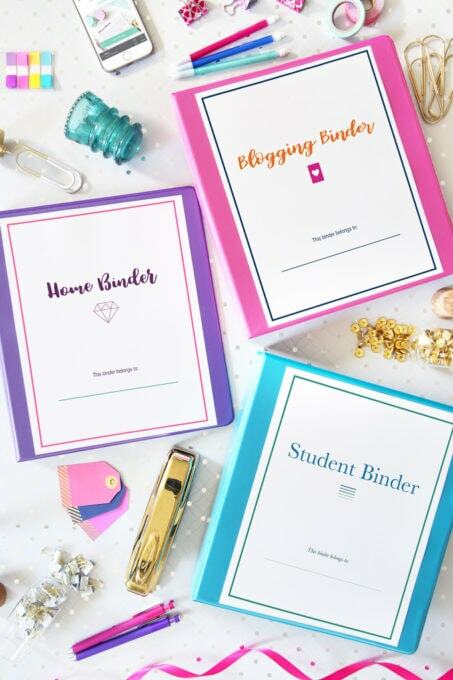 A lot of people have the blogging thing down and are in a nice routine but haven’t started to earn a substantial income for their efforts. Other people think they aren’t ready or don’t have the expertise to write and launch an eBook. We designed BookBoss to take you through our entire process from A to Z without holding anything back. For many of you this will be the pivotal moment for your business. It was for us. Oh no… we lost subscribers! Actually, we deleted 16,000 cold subscribers who hadn’t opened any emails in the past 90 days. ConvertKit has a nice tutorial walking you through the pruning process. Our goal has always been to grow a dedicated, focused email list, so it doesn’t make any sense to keep cold subscribers around just for the numbers. Though our total number of subscribers is smaller, we will take quality over quantity any day! RPM is a metric to track revenue per thousand pageviews. This is a measure of the overall effectiveness of a blog and is a handy benchmark for comparing blogs even if they have vastly different traffic numbers. So that was March! We are so excited about the response to our BookBoss course so far, and we can’t wait to see what our students do with it once they have implemented the strategies we teach. 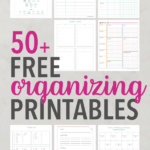 I truly believe it will be a total game changer for peoples’ blogs and businesses! 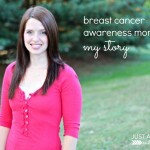 Thank you so much for your continual support of Just a Girl and Her Blog. We certainly could not do any of this without you, sweet readers, and we are always grateful for all you do! Hope you’re having a wonderful week! Great month, well done! Will be interesting to see what a full month of the new book sales does! You and Donnie are truly inspiring. Daily my husband and I talk about eBooks and what we are learning new from you. I ask him daily “What are you going to write your first eBook on?”. He normally asks me the same question. I think deciding on topic is the hardest step for us both but grateful that we have you both to teach us the skills to launch successfully. Thank you! Hi Abby and Donnie: Thank you for all you share. My brain is literally bursting with all the information I get from your webinars, ebooks and blog. At times it kinda hurts there is so much crammed in there! Ha. I purchased Building a Framework, and refer to it everyday. And Yes! I would love a dedicated post with your entire webinar process and all the technical details. Thank you! You guys are so inspiring! Hi Donnie! I sat through 2 of your webinars during pre launch and they were great. I was on the one where you got cut off 90 minutes in. The technical challenges of large webinars is interesting to me. In the corporate world we use Webex or GoToWebinar, why don’t bloggers use those more often? Are they super expensive? I’d love to read a detailed post about the topic!! Hey Donnie! I’m interested in seeing a specific post on the webinar process. Thanks so much! Wow guys this is awesome! And it is so inspiring! 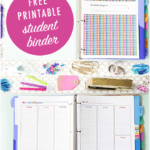 I would love to start a blog and I am reading through your 7 day blog challenge now so hopefully one day I will have a blog this pretty, informational, inspiring, and encouraging to share. You are rocking it! 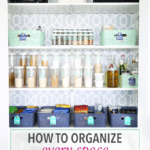 What an inspiration to other bloggers looking to make a full time income. Thanks for sharing your detailed report! Hi Ali! You’re too sweet! Thanks so much for stopping by and subscribing! Hope you have a wonderful weekend! Good Morning! Thanks for sharing your financials, I always learn something!. I have been a subscriber for some time and love following you! My question is regarding your expense from Flywheel of only $28. I use them and pay significantly more although my views are just shy of half of yours. Is there a secret? The expense is a big ouch for me every month! Thank you! Hi there! The Flywheel hosting is for our other site, buildingaframework.com, which has pretty low pageviews since it is new. We use Synthesis hosting for justagirlandherblog.com. Sorry I don’t have a big money saving secret! Hope you’re having a great week! I actually just moved over to Orange Geek and am saving $75 per month so pretty happy about that! Really appreciate your response! Lotsa love for Flywheel but they are pricey! Fist of all I want to say you guys are awesome. 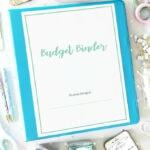 Your Income Report makes bloggers like me to stay more focus on my blogging and never give up. So glad they are helpful for you, Muhammad!